Here's a look at some of the heaviest snowfall totals from Saturday and the golden snow shovel award goes to Canby at 19" !! However, note how many other double digit tallies there were! The official tally at the MSP Airport was 11.1" on Saturday and 1.1" on Friday bringing the 2-day total to 12.2"! And of course more snow fell on Sunday, which will only add to these tallies! Here's the snowfall analysis from Friday into Saturday, which shows the heavy snow swath across the Upper Midwest. Keep in mind that many had double digit tallies across the region, which makes this one of the largest April snow events on record! 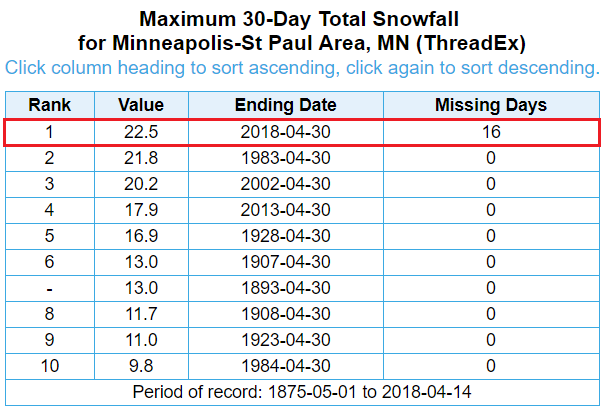 With the addional 12.2" of snow officially at the MSP airport on Friday and Saturday, that puts us at 22.5" for the month and good enough for THE Snowiest April on record! Note the previous record was back in 1983, when 21.8" of snow fell at the MSP Aiport. WOW! 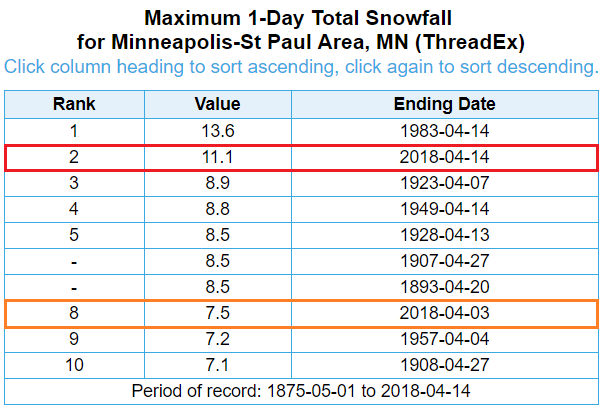 While the Twin Cities didn't officially have the Snowiest April day on record (that is still 13.6" set on April 14th, 1983), we did have our 2nd snowiest April day on record with 11.1" set 35 years to the day! Also note that this year also has the 8th snowiest April day on record with 7.5" set on the 3rd! UNCLE! Enough already... Well, it looks like we're not quite out of the woods yet when it comes to the wintry weather. Another weaker system will arrive midweek with another round of snow, which could add up to a few inches of slush. Stay tuned..
"Unfortunately snow chances are not over for the season. A wintry mix is in the forecast for Tuesday night into Wednesday morning, with accumulating snow looking likely. 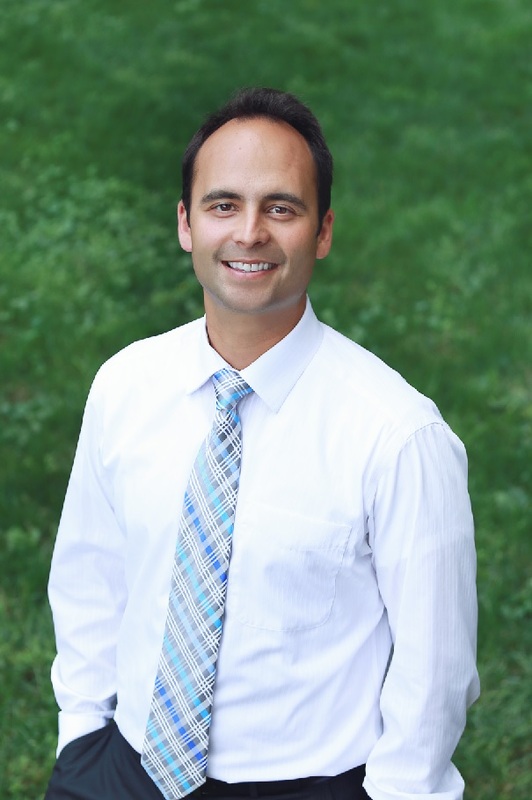 Stay tuned for updates on this developing system." If you can believe it, we may have another snow event in the works on Wednesday. Here's a look at the quick moving storm as it scoots across the Upper Midwest midweek. The good new is that the storm is much smaller than the system we just dealt with, but it may be strong enough to drop a couple/few inches for some across southern Minnesota. Take a look at ice out dates across the state from last year. 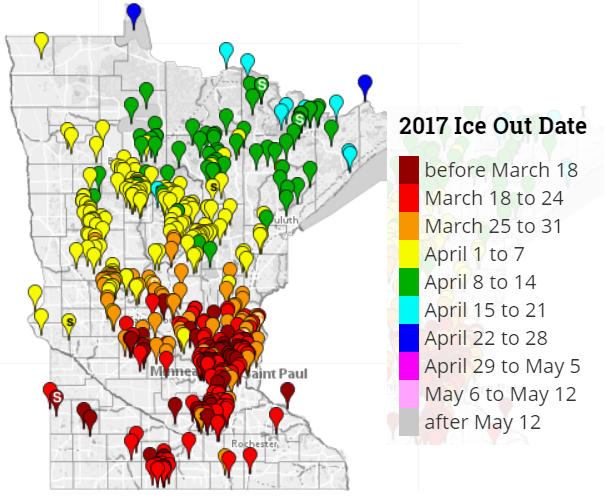 Note the darker red markers, which indicated that ice out occurred on many lakes in central and southern MN before March 18th! As of April 15th, we have no ice outs anywhere across the state this year. This storm really was impressive. Not only in its size, but in its scope of severe weather and heavy snow. This was a satellite image of the storm as of early Sunday, which showed it stretched from the Gulf of Mexico to Canada. 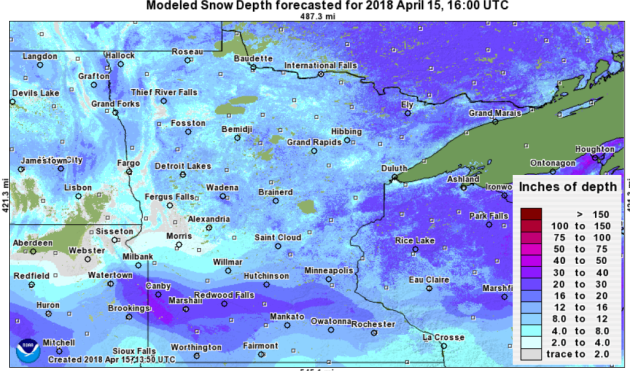 Here's the latest modeled snow depth across the state from April 15th, which shows quite a bit of snow still on the ground across much of the state after our latest round of snow from over the weekend. 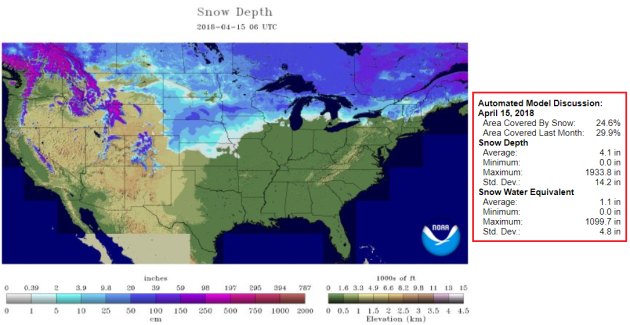 Note that MOST of the state is still covered in snow, which is quite impressive for the month of April. 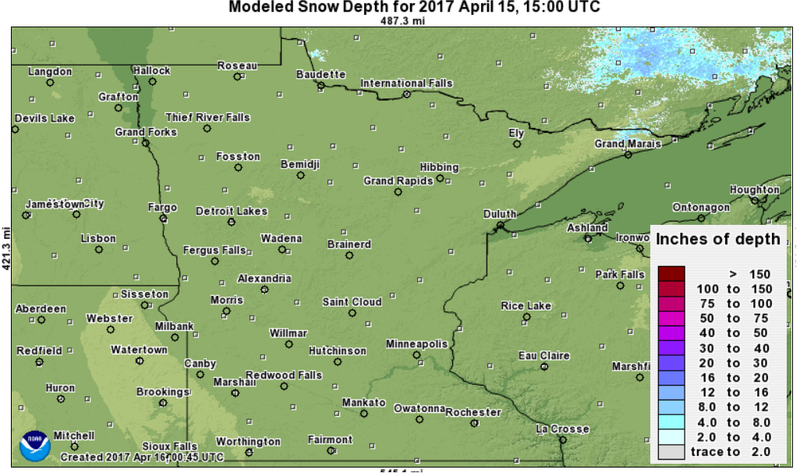 Last year at this time, the only spot that had snow on the ground was across far northeastern Minnesota! Just for comparison, this is a look at the snow depth across the state from this time last year! Note that the only spot that had snow was across the far northeastern reaches of the state! The rest of state was pretty much snow free and ice was coming off of many lakes across the state as well! Wow, what a difference. Here's a list of the latest first 60F high temp for the Twin Cities on record. Note that the record was on April 29th set in 1874, but the most recent was on April 26th set in 2013! At this time last year on April 16th, we had a high temperature of 66F at the Twin Cities Airport! 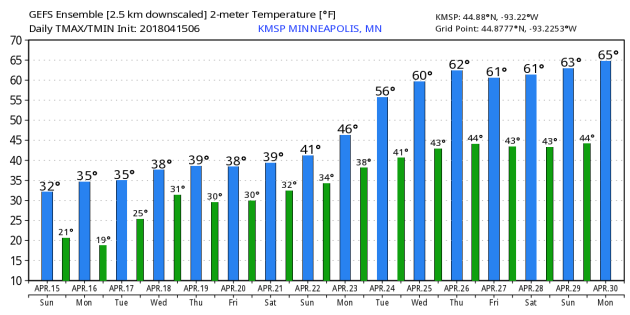 The extended forecast through April 29th & 30th suggests very chilly temps continuing as we head through the 3rd full week of April. Highs will continue to only warm into the 30s and 40s, which is more typical of March. Keep in mind that the average high for mid April is in the upper 50s, so we are running WELL below average. The images below suggest the GFS (American model) and ECMWF (European model) temperature outlook. It is nice to see that both show gradual warming as we approach the end of the month. Hopefully we actually warm into the 60s by the end of the month like the models are indicating! Coldest Start to April on Record! 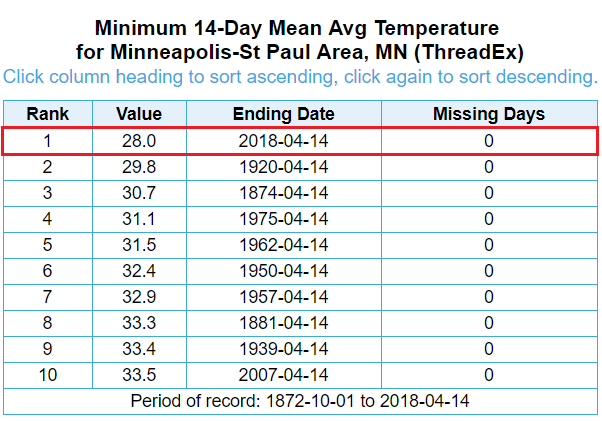 With temperatures running -15.5F below average this has been the coldest start to any April on record for the Twin Cities. The average temps is 28F, which is nearly -2F coldest than the previous coldest start to April on record, which was back in 1920. According to NOAA's GLERL, the Great Lakes were 6.7% covered in ice as of April 14th. 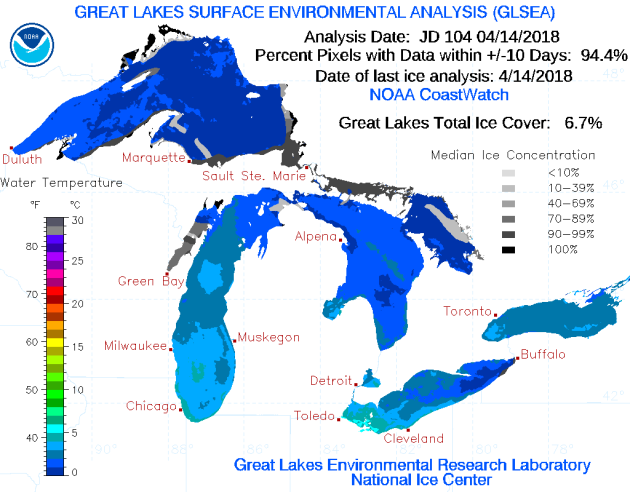 Interestingly only 0.6% of the Great Lakes were covered at this time last year. Here's a look at the ice coverage across Lake Superior and as of April 15th, NOAA's GLERL, said that 9.2% of Lake Superior was covered. Interestingly, at last time last year only 0.7% of the lake was covered in ice! Quite a difference from this year to last. 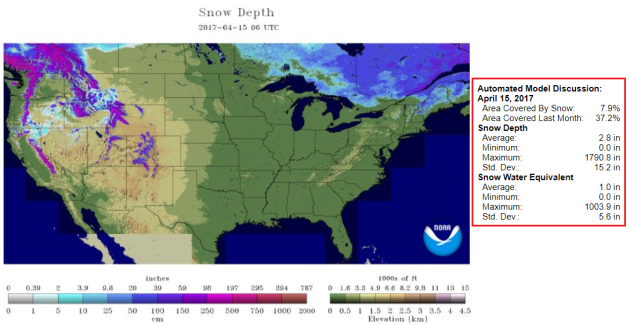 The snow depth map across the country for April 15th suggests that 24.6% of the country is covered in snow, mainly across the northern tier of the nation and across the Intermountain West. At this time last year, 7.9% of the nation was covered in snow. 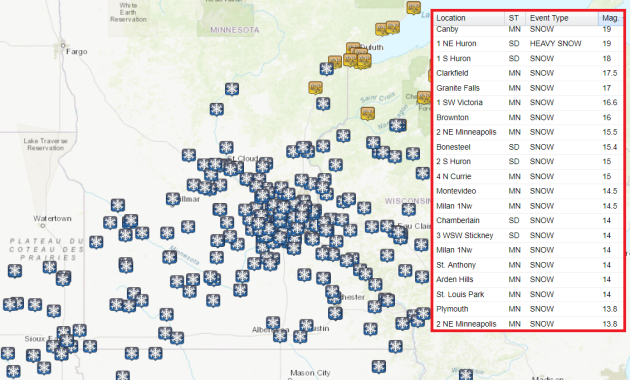 As of April 15th, the Twin Cities officially had 10" of snow on the ground at the MSP Airport, and at this time last year, there was no snow on the ground. Note also that last year at this time, the Sierra Nevada Range in California had a significantly greater snow pack than what is there now. At this time last year, 7.9% of the nation was covered in snow. 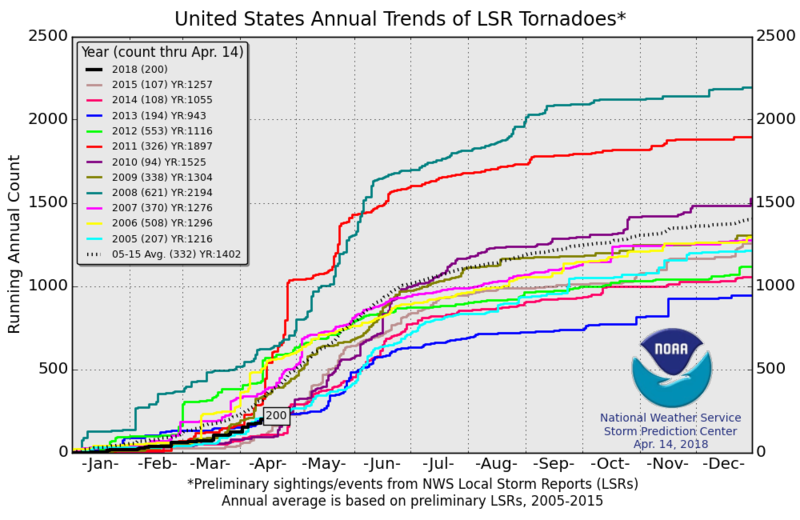 According to NOAA's SPC, there have been 200 preliminary tornadoes so far this year (April 14th), which is more than what we had at this time in the last couple of years. Interestingly, there were 621 tornadoes at this time in 2008; that year ended with 2,194 tornadoes, which is nearly 800 more than the short-term 2005-2015 average. 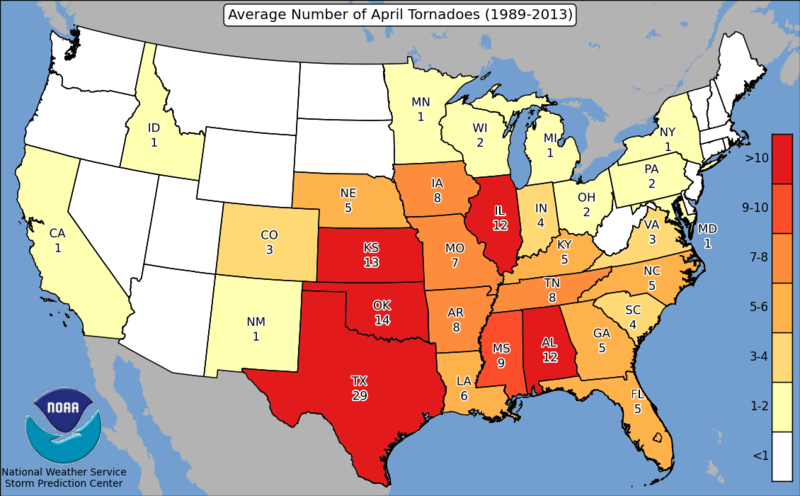 Here's the average number of tornadoes during the month of April by state. Texas sees the most with 29, but interestingly, Minnesota averages 1 tornado in April. 1.) Heavy precipitation across portions of the Mid-Atlantic, the Northeast, and the Great Lakes, Mon-Wed, Apr 16-Apr 17. 2.) Heavy snow across portions of California, the Central Great Basin, the Pacific Northwest, the Northern Rockies, and the Northern Great Basin, Mon, Apr 16. 3.) Heavy snow across portions of the Central Rockies, the Central Plains, and the Northern Plains, Fri, Apr 20. 4.) Flooding possible across portions of the Middle Mississippi Valley, the Great Lakes, the Ohio Valley, the Upper Mississippi Valley, and the Tennessee Valley. 5.) Flooding occurring or imminent across portions of the Lower Mississippi Valley and the Ohio Valley. Flooding likely across portions of the Northern Plains. 6.) High winds across portions of the Central Plains, the Central Rockies, the Central Great Basin, the Northern Plains, the Northern Rockies, the Southern Rockies, the Southern Plains, and the Southwest, Mon-Tue, Apr 16-Apr 17. 7.) High winds across portions of the Southern Rockies, the Central Rockies, the Southern Plains, and the Central Plains, Fri, Apr 20. 8.) High winds across portions of the Mid-Atlantic and the Northeast, Mon, Apr 16. 9.) Much below normal temperatures across portions of the Plains, the Mississippi Valley , the Great Lakes, and the Ohio Valley, Mon, Apr 16. 10.) Enhanced wildfire risk across portions of the Southern Rockies, the Southern Plains, the Central Great Basin, the Central Plains, and the Southwest, Mon, Apr 16. 11.) Enhanced wildfire risk across portions of the Southern Rockies, the Central Plains, the Southern Plains, and the Southwest, Tue, Apr 17. 12.) 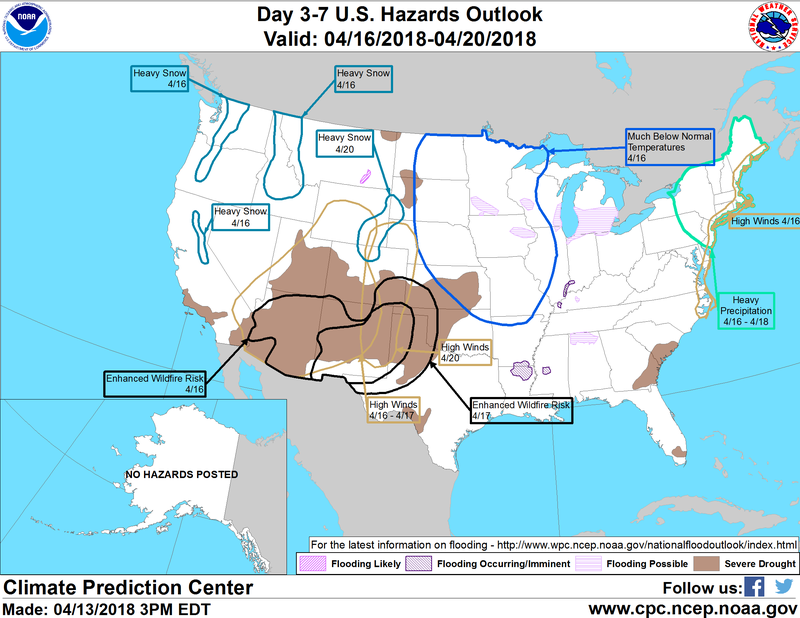 Slight risk of heavy precipitation for portions of the Central Plains, the Lower Mississippi Valley, the Tennessee Valley, the Middle Mississippi Valley, the Southern Plains, and the Ohio Valley, Sat-Mon, Apr 21-Apr 23. 13.) Severe Drought across the Central Plains, the Central Rockies, the Central Great Basin, the Northern Plains, the Southern Rockies, California, the Southeast, the Southern Plains, and the Southwest. 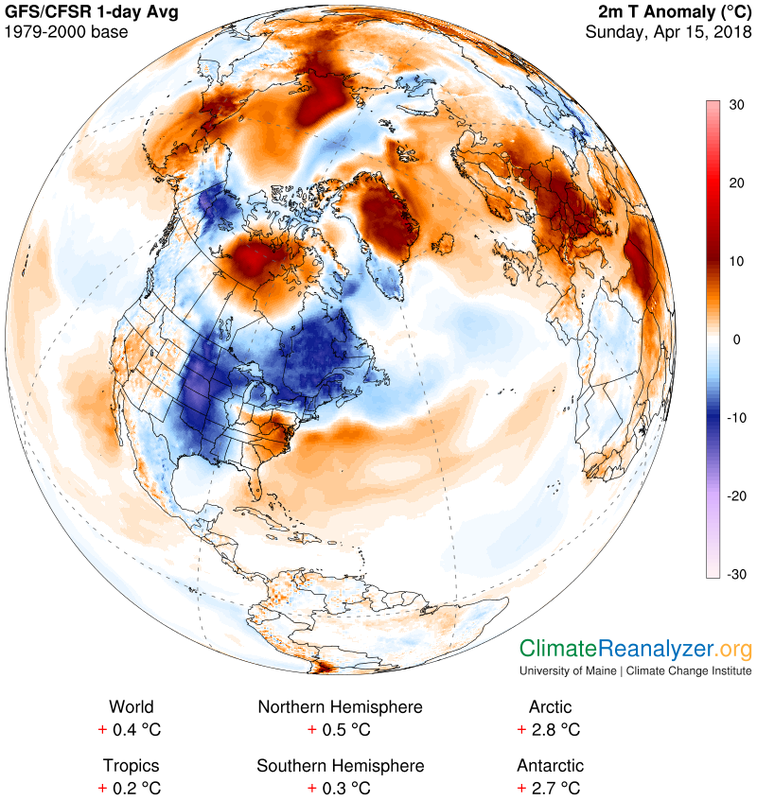 The temperature anomaly across North America from Sunday, showed WELL below average temperatures across a large chunk of Canada into the Central US. This colder air has been pretty constant across much of the nothern tier of the nation so far this month. Weather conditions will remain quite active as we head into the 3rd full week of April. The big storm responsible for heavy snow and severe weather since last Friday, will finally start fading across the Great Lakes and Northeast by the early week time frame. Meanwhile, another storm will enter the Northwest with another round of heavy rain along the coast and high elevation snow. According to NOAA's WPC, the 7-day precipitation outlook suggests areas of heavy precipitation continuing across the Great Lakes and Northeast into the early week time frame, while another round of heavy moisture moves into the Northwestern US. Also note the batch of heavier moisture that looks to develop in the Central US late next week. 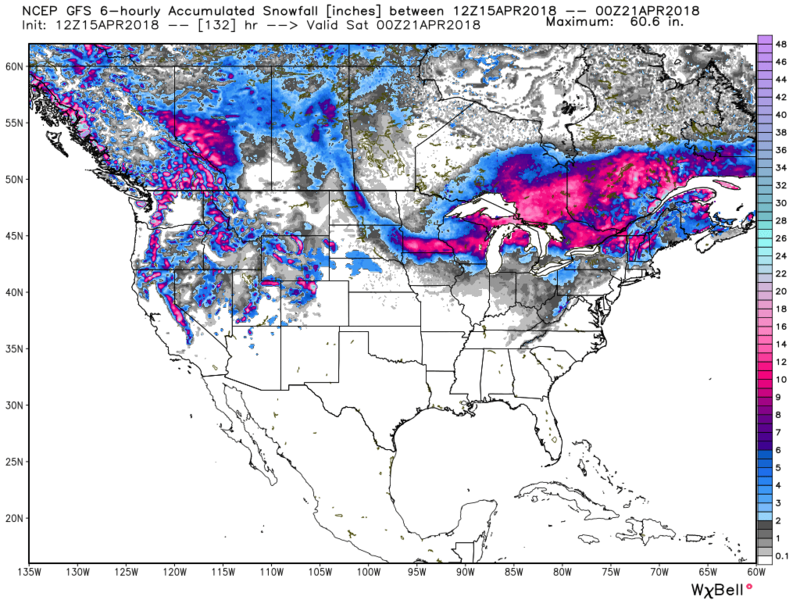 The GFS snowfall potential as we head through next week still suggests areas of heavy snow across the high elevations in the Western US, while bouts of snow may still be possible across the Cental and Northeastern US. Winter still seems to be hanging on, doesn't it? Go BIG or go home. That ethos certainly applies to our weather. "Supersize me please!" 16 mega-rain events since 1858, according to the Minnesota DNR - 9 of those since 2000. Wettest June on record in 2014. And now the snowiest April since 1872 - over 23 inches and counting. More moisture in the air juices summer rains and winter snows; slower-moving weather patterns magnify the impacts. The weekend was an atmospheric freak show: the first Blizzard Warning at MSP since 13.6 inches fell on April 14, 1983. Hey, it gave us something to talk about. A common bond of shared weather-misery. 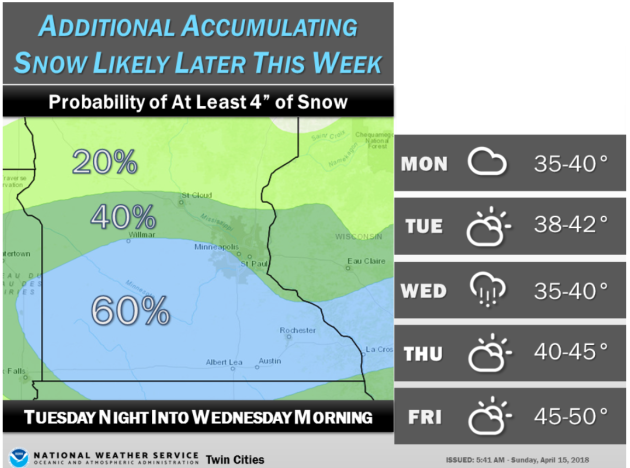 On Wednesday storm may brush southern Minnesota with a slushy mix, but there's no cause for panic. A sun angle similar to late August will melt snow rapidly, allowing the sun's energy to heat up the air. Expect 40s much of this week; maybe 50F by the weekend. Long-range models continue to insist that we'll see a few 60s by late April. Yes, please. Yesterday we shoveled a path in the backyard for Leo, our dog, after he did his business on our patio. I suspect it was a defiant act of protest. MONDAY: Mostly cloudy. Winds: NW 10-15. High: 36. MONDAY NIGHT: Mostly clear and chilly. Winds: NW 5-10. Low: 21. TUESDAY: More sunshine. Getting better. Winds: NE 5-10. High: 40. WEDNESDAY: Slushy mix possible. Winds: NE 10-15. Wake-up: 29. High: 42. THURSDAY: Partly sunny. Rapid snow melt. Winds: W 5-10. Wake-up: 32. High: 46. FRIDAY: Intervals of sun. Big puddles. Winds: NW 5-10. Wake-up: 33. High: 48. SATURDAY: Mix of clouds and some sun. Winds: E 5-10. Wake-up: 34. High: 51. SUNDAY: Some sun. Hints of spring again. Winds: E 5-10. Wake-up: 35. High: 54. Temps on Monday will still be a VERY chilly as high temps only warm into the 30s and 40s. 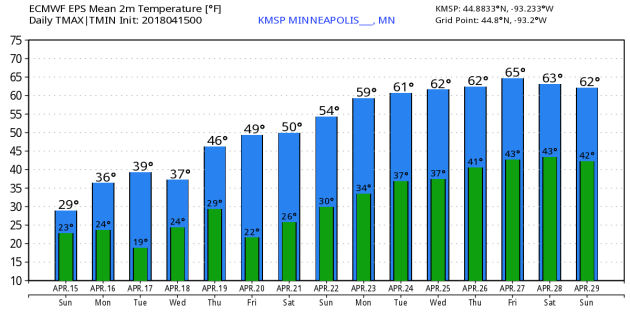 Keep in mind that the average high in the Twin Cities is 58F for the 16th day of the month, so we will be nearly -20F below that mark. Feels like temps will only be in the 20s, so bundle up! According to NOAA's CPC, April 22nd - 28th will still be very chilly across much of the northern tier of the nation. Meanwhile, warmer than average temperatures will still be found in the Southern US. "Lyrid Meteor Shower 2018: When It Peaks, Where To Watch"
"The fickle Lyrids sometimes produce fireballs and up to 100 meteors an hour. Will this be the year the shower will have an "outburst"? The spring and summer meteor shower season starts this month with the Lyrid meteor shower, which runs April 16-25, but peaks Sunday, April 22, but skywatchers may also see them on the days before and after the peak. 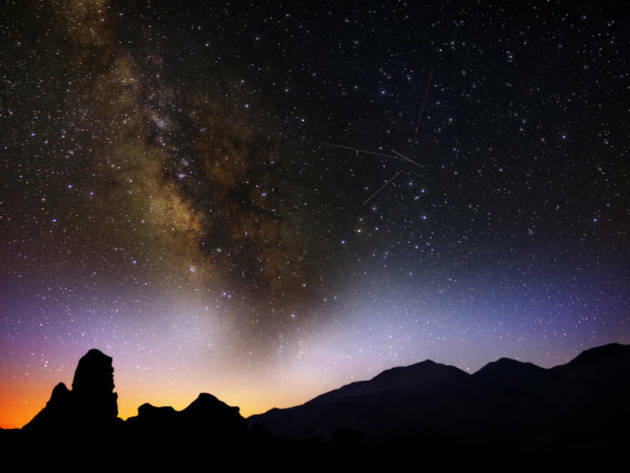 At its peak, the Lyrids will produce between 15 and 20 meteors an hour, and the best time to see the show is early in the morning before dawn on April 22. The moon will be out of the way and will have set before the Lyrids kick up, so the show should be a winner this year, depending on the local forecast. The Lyrids are known to be fickle and unpredictable, but typically produce about 15 and 20 meteors an hour, many with trails that last a few seconds and, occasionally, a few fireballs. In some years, the shower intensifies in what's called an "outburst" and produce up to 100 shooting stars." "The Arctic Is Breaking Climate Records, Altering Weather Worldwide"
"The Arctic climate is shattering record after record, altering weather worldwide. Twenty-five scientists, including me, had an epiphany about the Arctic in 2003. The National Science Foundation had invited us to a retreat in Big Sky, Mont. Before this gathering, each of us had been focusing our Arctic research on our own narrow topics. As we shared our perspectives, we came to a frightening realization:"
"China is using furnaces to manufacture 10 billion tons of rain"
"Plans for thousands of chemical rainmakers in the Tibetan Plateau. In an effort to solve some of the country's water shortage problems, China is building tens of thousands of chemical rainmakers. The goal: manufacture 10 billion tons of rainfall on the Tibetan Plateau. The silver iodide furnaces developed by the China Aerospace Science and Technology Corporation (or CASC) will be placed on Himalayan mountains at altitudes above 16,400 feet. These "cloud seeders" encourage puffs of vapor coming from the Indian Ocean to produce rain, something they don't do on their own given the geography of the northern part of the Tibetan Plateau and the Qaidam Basin. Those northern areas fall into a "rain shadow;" low-altitude clouds are blocked by the southern part of the Himalayas." "Freak floods drown buildings, bone-chilling air flash-freezes pedestrians and ice encases the Statue of Liberty. It sounds like a disaster movie, and well, it is: In 2004's "The Day After Tomorrow," the collapse of an ocean current in the North Atlantic sends the world into a whirlwind climate doomsday. And while that ocean current has not actually collapsed, scientists reporting in two new studies have found that it's weakening, by a lot. In fact, the current hasn't been this sluggish in 1,500 years — a finding that could carry serious (although not disaster-movie serious) repercussions for weather and sea-level rise in locations around the world. In the Atlantic Ocean, the current known as the Atlantic Meridional Overturning Circulation (AMOC) ferries warm surface waters northward — where the heat is released into the atmosphere — and carries cold water south in the deeper ocean layers, according to the National Oceanic and Atmospheric Administration. Its circulation transports heat around the globe like a conveyor belt, and if its movement were to stop, that heat would not get distributed, and weather havoc could ensue." "Acid rain triggered deadly Chinese landslide"
"On June 5, 2009, a catastrophic landslide killed 74 people in southwestern China. But a lack of recent earthquake activity or heavy rainfall left geologists questioning what had triggered the slide. A new study suggests that China’s acid rain may have played a role in weakening the limestone and shale slope in unexpected ways. The Jiweishan Mountain landslide occurred near Chongqing, China, in the heart of southwest China’s limestone karst region, where rainwater has gradually been dissolving water-soluble limestone for millions of years, creating a dramatic, mountainous landscape cut by steep drainage systems, potholes and caverns. “Even the cleanest rain can attack limestone,” says Ming Zhang, a geoengineer at the China University of Geosciences in Wuhan, and co-author of the new study published in Earth and Planetary Science Letters. However, China’s widespread air pollution from coal-fired power plants has led to some of the most acidic rain on Earth: Burning coal releases sulfur dioxide, nitrogen dioxide and other pollutants into the atmosphere, where they are assimilated by falling rainwater, creating sulfuric acid and nitric acid. Acid rain typically has a pH under 5, while normal rainfall, which absorbs acidifying carbon dioxide from the atmosphere, measures 5.6. Between 1986 and 2014, the average annual pH of Chongqing’s rainfall varied between 4.3 and 5; at times, the pH dipped as low as 2.8, making it especially corrosive to limestone — and possibly other rocks as well." Wednesday Slush Potential - 60 Degrees Next Week?